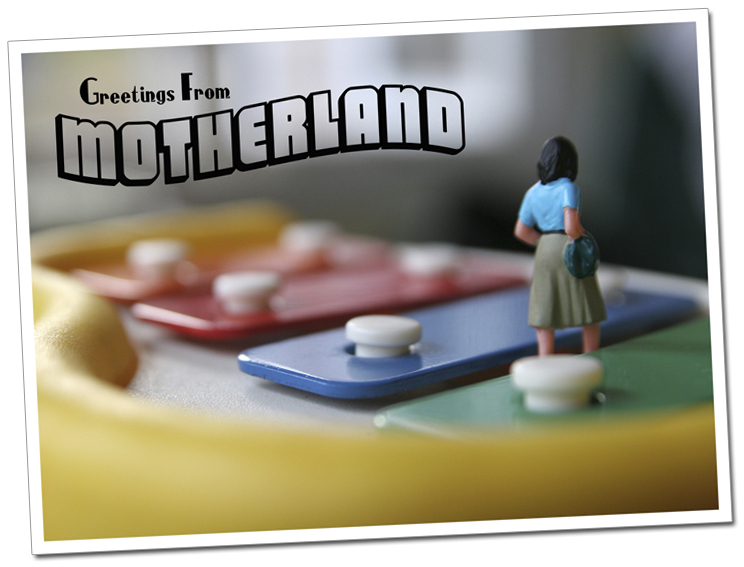 Greetings from Motherland is not a new book that’s out from another mommy blogger. It’s actually a series of art projects about motherhood and it’s on my radar! “Landing Gear” is a unique interactive multimedia installation about early motherhood told through the clothes we wear. The installation, which features photographs, documentary audio housed in an antique wardrobe trunk, writing, collage, and clothing, will be exhibited at the Arcadia Gallery in Toronto. It is the latest collabration between community members led by artist Mindy Stricke. Her work has been featured in the New York Times and other international publications. Her work has also been featured in the documentary “At the Table: Mothers Sharing Stories through Art”, which has screened in various film festivals across North America. The mothers told their stories that have now become the fabric of this art project. While on display, other mothers can add their experiences at the gallery as well as on the “Greetings From Motherland” website and Facebook. Mindy Stricke (Artistic Director) is a photographer and multidisciplinary artist who combines photography, documentary audio, writing and other mediums to create interactive installations, often created collaboratively with community members. In 2009, she started Greetings From Motherland, a series of participatory art projects bringing women together to make art that challenges traditional representations of motherhood. Her photographs and installations have been exhibited throughout North America, and have been featured in international publications including The New York Times, Time Magazine, Newsweek, Voce, and the Smithsonian Institute Photography Initiative’s Click! Photography Changes Everything. Originally from New York, she now lives in Toronto with her husband and two young children. Gallery open 11-5 on weekends (7 pm on the Sunday opening), and 4-7 pm on weekdays. When I was reading her blog about the workshops I stumbled across this excerpt…and wanted to share. “I saw this series of workshops as a pilot for a new idea I wanted to explore, and after eight weeks of arts-based research into the question of how the pressure to be a good mother affects our lives, I’ve learned a lot. What was most interesting to me is that many women in this group, although they do seem to struggle under that yoke, see the good mother ideal as something to aspire to, rather than resist. Others actively try to resist it, while others just felt that it wasn’t particularly relevant to their lives. The women who had the youngest children seemed to feel the pressure to be a good mother the most, which isn’t surprising at all. I think it’s common to spend the first few years of parenting figuring out your identity as a mother and gaining confidence in your new role. I know that for myself, I spent a lot of time in the early months reading parenting manuals and being confused about what I was doing. By the time I had my second child, three years later, I knew much more about who I was as a mother, and I stopped reading so much advice or being so affected by the myriad of opinions as to the right way to do things.” ~ Mindy Stricke.